Whoever coined the term “stainless steel” was stretching a wee bit, in my humble opinion. Or else he never lived in the country. Here at the farm, where our water flows through a chemistry set before it ever reaches the taps, stainless steel is definitely not stainless. Behold the laundry room sink. Now, I will admit that I wash more paintbrushes than laundry in this sink. However, beyond the paint spatters, there are watermarks, film and just a general dullness. In my sparkly new laundry room, this would not do. I tried various methods to clean it. Every cleanser I own. Nope. Every cleanser I own with lotsa, lotsa elbow grease. Nope. 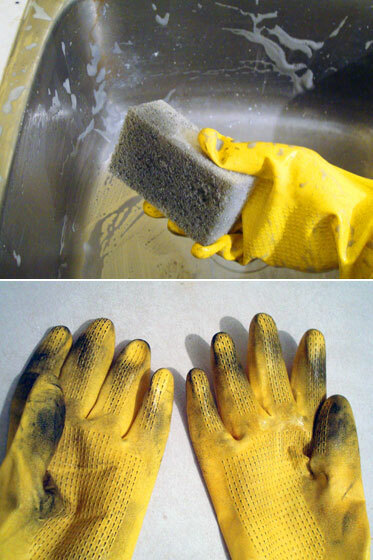 Pinterest remedies like a vinegar-soaked paper towel wrap. Nope. Nothing could break through the dullness and bring back the shine. 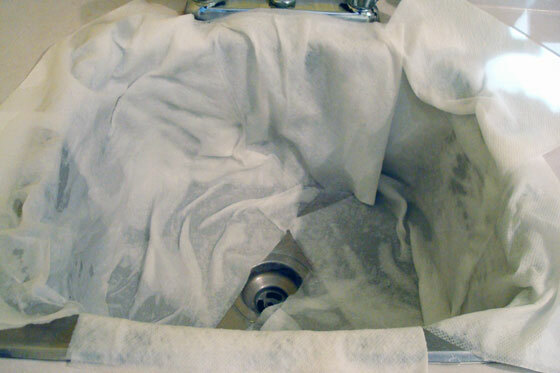 Gentle readers, the clouds parted, the seas calmed, the heavens shone… and so did my sink. There’s even a reflection! 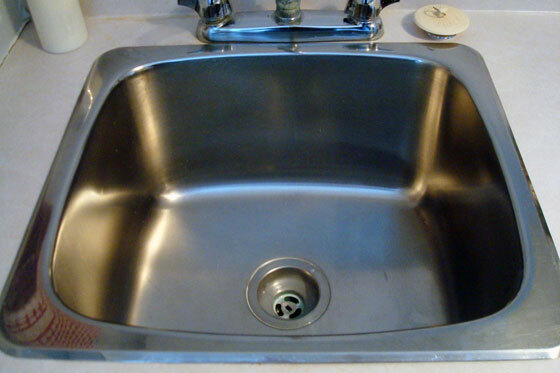 Turns out my so-called “stainless” steel sink had some kind of tarnish on it. It still took lotsa elbow grease, and the finish still isn’t perfect, but it’s a heckuva lot better than it was before. Oh, and I still don’t believe in stainless steel. Do you believe in stainless steel? Any cleaning tips to share? Who else washes more paint brushes than laundry? And a disclaimer: The Universal Stone people have no idea who I am. I bought my own Universal Stone with my own money. Nice job! We’ve never heard of “Universal Stone,” but if you’d asked us, we’d have loaned you our can of “Never-Dull,” which we always used to clean the stainless steel on our boat, including the sink. It does a terrific job with little elbow grease. You are certainly right about stainless steel not being stainless, nor is it “rostfrei” (rust-free), as the Germans term it. There are many grades/types of stainless steel, the one used on boats being “SAE316” but it still rusts if left too long exposed to saltwater. I am not a completely “green” person but I try to use more natural ingredients at times and one of my favorite cleaners I found on Pinterest (of course 😉 ). Mix Dawn dish soap, vinegar and water. 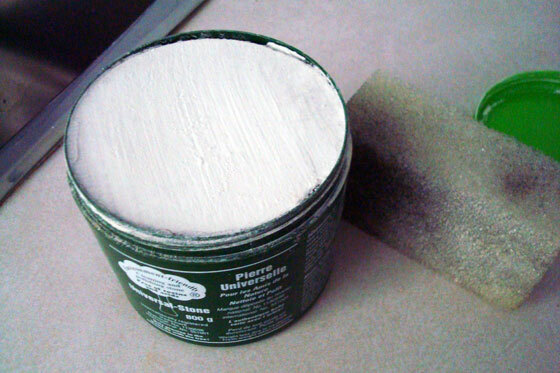 And if you need a little abrasive, sprinkle baking soda first to make a paste. It is one of the best cleaners I have used! 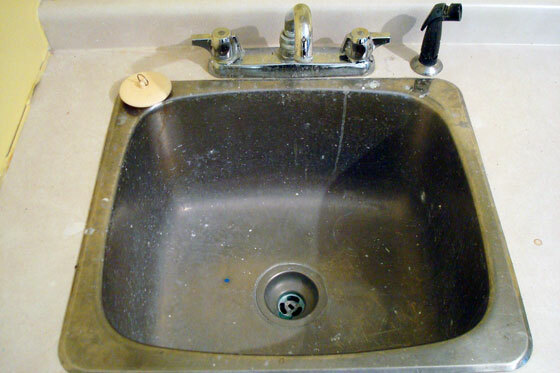 Not sure how that would have worked with the paint on your sink but for everyday use it is my favorite! Dawn dish soap seems to be the solution to many problems. I was kind of frustrated with my vinegar attempt. Perhaps some Dawn and baking soda were what was missing. Me too. My drill is my favourite tool. Attaching a brush to it makes so much sense. I’ve heard a lot about BKF. Thanks for the tip.